Without doubt, one of the greatest 20th century novelists writing in English was Graham Greene. He was also one of the most popular: his prose was lucid, his plots were gripping, and as a “writer who happened to be Catholic” (he hated the term “Catholic writer”), he wrote compellingly about the human condition with theological insight as well as psychological depth, exploring the perennial themes of good and evil, sin and salvation, faith and doubt. 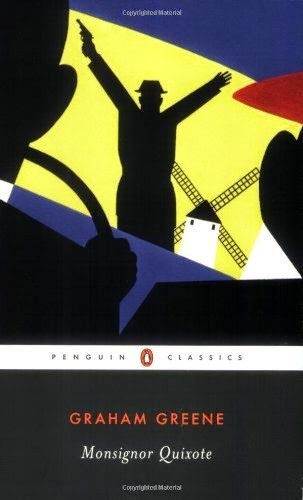 One of my favourite Greene novels is Monsignor Quixote, published in 1982 (I read it during my first month as a minister). Called “a fable for our times”, it’s an affectionate pastiche of Cervantes’ 17th-century masterpiece Don Quixote. It describes the exploits of a small-town priest, unexpectedly made a monsignor by the Pope (“what strange stirring of the Holy Spirit,” observes his resentful bishop), as he travels around Spain in his Seat 600, tilting at windmills, accompanied by his ex-mayor friend nicknamed “Sancho” (what else! ), who happens to be a communist. As you might imagine, their conversations are, well, interesting, as the churchman and the atheist not only argue but are forced to re-examine their own beliefs. One of the funniest scenes in the novel finds Father Quixote in a pub toilet with a man who wants to make his confession. “Never before had he heard a confession in such surroundings. He had always been seated in that box like a coffin … [So] It was almost automatically that he took refuge in the only box available and sat down on a closed lavatory.” It turns out that the man is an undertaker who has stolen the brass handles off the coffin in which he had buried a priest that morning. Good question: What’s the difference? Is there any? Is a confessional holier than a khazi? What, indeed, is “holiness”? In the Bible, one opposite of holy is “unclean” – like a lavatory. The Pharisees in particular were sticklers about “purity”, moral as well as ritual. They had a defensive notion of sanctity: pollution is contagious. Contact with the visibly sick and the obviously immoral – with lepers, for example, or “tax-collectors and sinners” (Matthew 11:19) – no way! Don’t touch, don’t talk, keep your distance! Hence the fastidiousness and the fearfulness of their faith. Jesus, by contrast, had an offensive notion of sanctity: it is not stain or sin but goodness – but grace – that is catching. Hence the robustness and the fearlessness of his own faith. The Reformer Marin Luther also had this bold and feisty faith. He once wrote to an uptight upright colleague (Philip Melanchton): “Sometimes it is necessary to drink a little more, play, joke, even commit sin in defiance and contempt of the devil, in order not to give him the opportunity to make us scrupulous about small things.” Yet does not being “scrupulous about small things” – Father Quixote’s “little thing[s]” – doesn’t this sum-up the nit-picking piety of so much church culture, so fussy, prudish, mischiefless, so downright boring – and so obstructive to mission? You’ve heard of “born-again” Christianity: this is “yawn-again” Christianity. What is holiness? Can God be found in a lavatory? How interesting that Luther claimed that his own theological breakthrough – justification by faith alone – came to him – you guessed it – in the WC! God is Lord – Lord of the loo too! Perhaps, then, punctilious notions of purity and probity have little to do with real holiness, the offensive holiness of Jesus. Perhaps in focussing on little sins we miss the big ones, the weightier matters of justice, the weightiest matter of grace. Perhaps such a focus leads to defensive strategies of exclusion, as contemporary Pharisees police the borders of the church to keep out “the unclean” and “the unsound”. Perhaps what we often take to be beyond the moral or doctrinal pale has less to do with God’s righteousness and more to do with our own pathologies of rectitude. Indeed one reviewer of Monsignor Quixote (Robert Towers) suggests that “The rejection of [all] dogmatic authority … is the presiding theme of the book.” Not quite: for ultimately the novel’s “presiding theme” is the kindness of God, incarnate in weakness and doubt, in this hapless little priest, yet counter-intuitively triumphant over the malice and corruption of Grand Inquisitors in church and state alike. Monsignor Quixote will die from wounds received when, shot at by two Guardia, his little Seat crashes. Yet his atheist friend will muse that “the love he had begun to feel for Father Quixote seemed now to live in spite of the final separation and the final silence – for how long he wondered, with a kind of fear …?” With a kind of faith, be it the size of a mustard seed, we may answer: forever. For God is love, incarnate in Christ, stronger than death, and, yes, eternal.